Contains TRICOREPAIR, a complex with rice proteins with a restructuring action, Willow derivative with colour protective action and fruit lipophilic acids that take care of the scalp during the application of the dye. Thanks to the high content of unsaturated fatty acids and vitamin E, Argan oil protects, restructures and makes fragile and brittle hair shiny. To cover grey hair perfectly, already from the first application and for a long-lasting colour. From today, using Biokap Nutricolor colours is even more practical: just insert the Nutrifix bottle in the hole outlined on the back of the packet and wear the disposable protective cape supplied. Then mix the content of the colour tube following the instructions given in the leaflet. Choose the shade according to the quantity of grey hair, following the instructions on the packet. Ammonia, Resorcin, Paraben, Fragrance, Paraphenylenediamine nor Phenylenediamines. 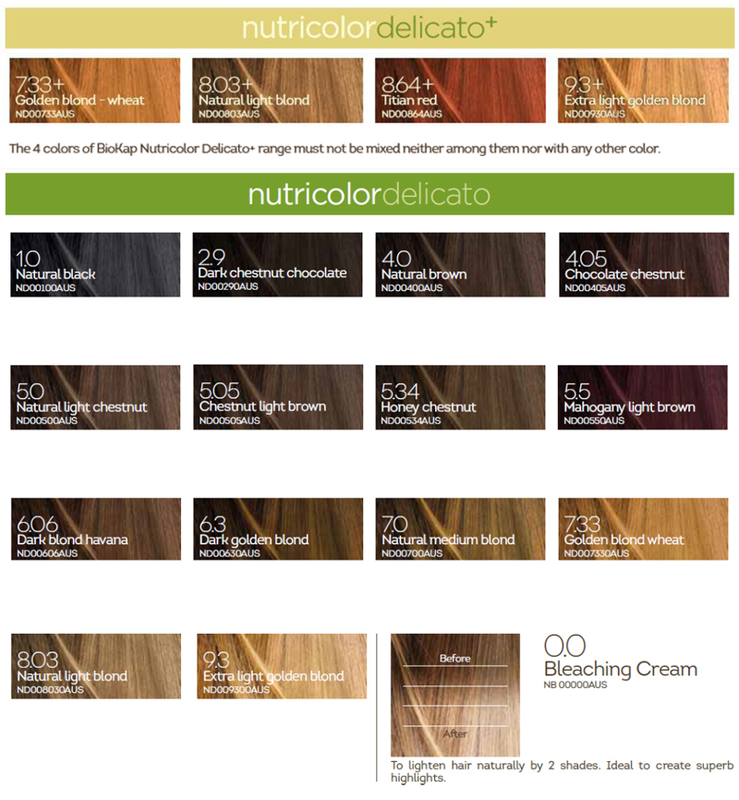 Biokap Nutricolor Delicato+ Hair Dye shades must not be mixed neither among them nor with the other Nutricolor and Nutricolor Delicato colours.